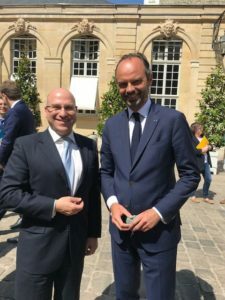 Aspen was one of the few companies invited by French Prime Minister Edward Philippe to attend the Health Industry Strategic Meeting on 9 July 2018 at the Matignon, Paris – the official office of the Prime Minister. Represented by Stavros Nicolaou and Fabrice Jover, Aspen had an opportunity to hold brief discussions with Prime Minister Philippe; Minister of Health, Dr Agnes Buzyn; French Junior Minister for Economy, Finance and Trade, Delphine Geny-Stephann and other officials. During these discussions Aspen was able to highlight its ongoing French production investment through its Notre Dame de Bondeville manufacturing site and its continued commitment to supplying quality, affordable and accessible medicines, most of which are life-saving, to the citizens of France and the European Union. Aspen has capacity to manufacture over 250 million pre-filled injectable thrombosis syringes for global distribution from this French-based site, and it is in the process of installing new capacity at the same site to manufacture anaesthetic products. During the meeting Minister Philippe also made certain announcements with respect to future pricing of pharmaceutical product in the French market.